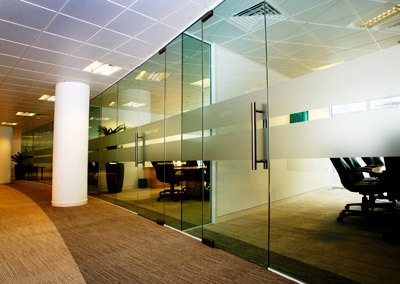 Blog > Why choose Glass Office Partitions for your business? Glass office partitions are a modern solution to dividing space between employees in the workplace, and are becoming more and more popular in contemporary offices worldwide. Frameless partitions are both sleek and elegant, adding a touch of style to the workplace. Initially, you might be wary about spending your money on what can be misconstrued as just a piece of glass, but that’s before you’ve learned the benefits that a glass office partition can bring to your office. They have the ability to transform any workspace into a bright, airy environment and boast a range of other substantial benefits, making them the obvious choice for any office. Do you find that your office gets too noisy at times? Don’t be fooled into thinking that glass panels won’t provide an effective sound barrier, as this actually one of major reasons why people opt for glass office partitions. In fact, double glazing in particular is one of the best materials that can be used for noise reduction, and also minimising noise pollution. This makes glass partitions the best solution for providing privacy to employees, ensuring that they are working in a more focused environment where noise is kept at bay. More focused staff makes for increased productivity. Any office would undoubtedly benefit from a flood of light into the area, which is something that ordinary windows and doors just cannot provide enough of. Floor-to-ceiling glass partitions, however, maximise the amount of natural light dispersed into a room, creating the illusion of a bright, open space. The presence of natural night can help enhance the mood of your employee’s, as sunshine helps to raise their serotonin levels, which has a direct effect on increasing their productivity. Not only can sunlight improve concentration and activity levels, but the added Vitamin D produced from natural sunlight helps boost the immune system, which could result in quite a significant reduction in sick days – as has been proven. Less sick days at home means more work days in the office, making for a happier, healthier and more productive workforce. As well as the feel-good effect that natural light can have on employees, the filter of sunlight into a space can help keep costs down, as you are minimising the expenditure on artificial lighting – and who doesn’t want to save money? So, the initial cost of installing can be balanced out by the savings in the long-term. Reducing electricity bills is just one way that glass office partitions are a cost effective solution for the office, the other being the way they are easily installed into a room with minimum disruption. The beauty of glass office partitions is how they’re so simple yet effective when it comes to refurbishment in the workplace, as they can be assembled and disassembled in no time and requiring no structural modifications. This is great for if you’re thinking of further expansion/reconstruction in the future, as they can be easily taken down and moved without an issue. Additionally, if you ever decide to move offices you can take them with you – making relocation quick and easy while keeping costs down. First impressions count, and on entering a building, any potential clients will immediately form an opinion about your organization – so it’s key to make that a good one. Companies are opting for glass office partitions due to the sleek, modern look they have about them which is a must in any contemporary office. Creating the feel of a bright, clean, modern office is what glass partitions do so well and are sure to instantly attract visitors and potential customers. It’s important to know that glass partitions come in a range of styles, so that you can find the perfect fixture for your office. For example, you have the option of a steel framed or frameless panel, and the choice between a full height or half height partition. There is also a choice of single, double or triple glazed partitions, depending on your specifications. 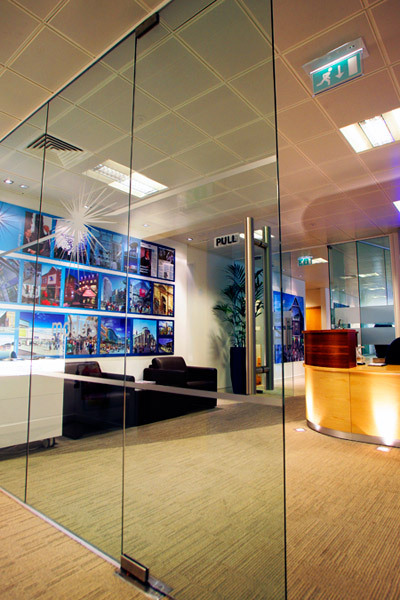 If you have specific design requirements, glass panels can be tailored to suit you, for a custom-made unique design especially for your office. Whether this be that you require frosted, tinted, coloured or printed glass, all styles are available. Regardless of your needs, there will always be a suitable choice to make for the perfect partitioning solution for your office. Glass office partitions create an added interest to any office design while creating space, introducing maximum light and giving the effect of an overall more professional atmosphere. With so many options available, glass office partitions are the perfect addition to any office looking to refresh, refurbish or improve their workspace.